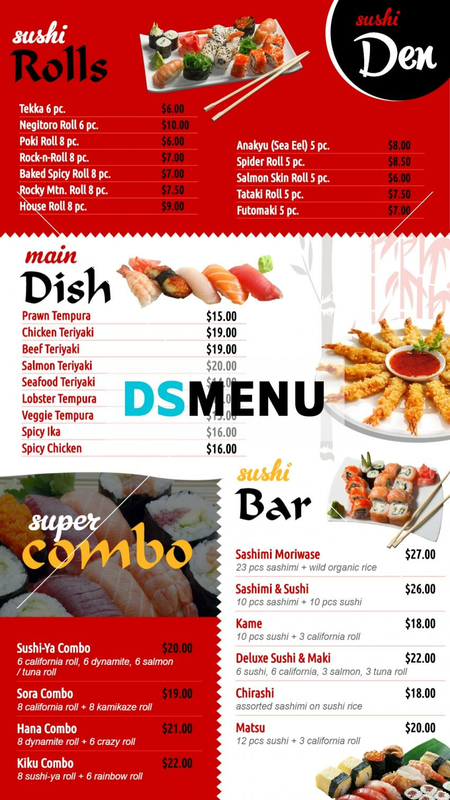 This brilliantly designed Japanese Sushi cuisine menu board is personified by its eclectic menu. The red and white dominant colors with red and black lettering and graphics gives this menu board the dazzle it richly deserves. The menu comprises of a delectable spread of Rolls, Tempura, Teriyaki, Ika, Sashimi, Chirashi, Matsu, as also with Super Combo offers. Needless to mention, on a digital menu board the impact on target audience will be scintillating with sales zooming northwards !